For the short stint in which I lived in Battersea, Queenswood quickly became my favourite place to watch the world go by, pouring over their menu which is, whilst arguably a tad pretentious, laden with fresh flavours and just the right amount of indulgence to draw in those less enthralled by the notion of a vegan lifestyle. From the names behind Damson & Co, Queenswood was met with, and has continued to evoke, a mixed reception. Fay Maschler, for the Evening Standard, was rather scathing about the place when it was newly opened in early 2015, deeming it ‘too healthy’. I disagree. And as someone who’s idea of heaven on Earth would be a vat of Swiss fondue devoured with crusty, carb laden bread, washed down with a bottle of vin blanc and swiftly followed by a nap in front of Gilmore Girls, I think I am a fair judge to set the record straight. 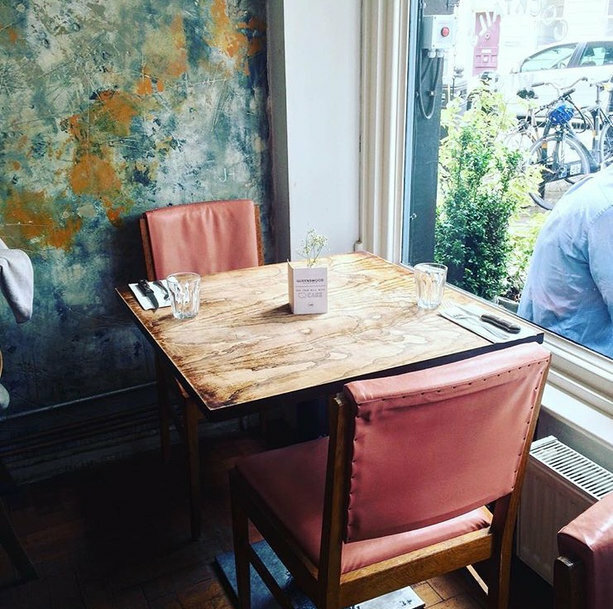 Whilst Queenswood is by no means for the most frugal of brunchers, the quality of the food and the creativity behind the menu is unquestionable. 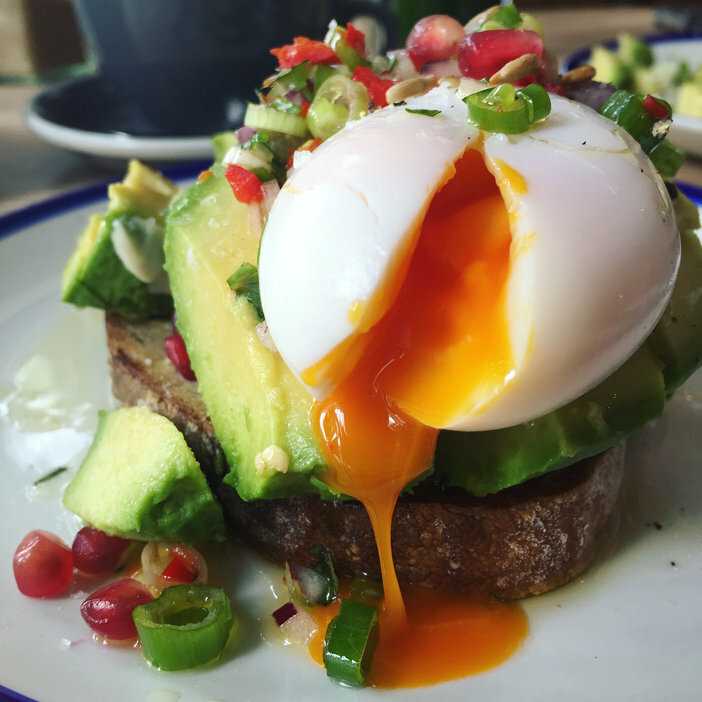 A simple avacado on toast is jewelled with pomegranate seeds and fresh chilli, cuddled by marscapone and finished with an Instagram-perfect yolk. Brunch or lunch for two could very easily set you back £40 including service, however I don’t doubt that you’ll leave feeling satisfied. Boring lunch time sandwiches be gone, Queenswood’s warm Squash & Carrot Falafal accompanied by quinoa salad, smoked aubergine purée and feta cheese manages to satisfies the balance between health-factor and taste. The beauty of these dishes is that you wouldn’t necessarily know that what you’re eating is good for you. The real star of the show though is the Watermelon & Ricotta with homemade puffed quinoa granola and basil sea salt. It tastes as good as it sounds ostentatious. The interior is light and airy, combining earthy wood with a shabby-chic paint job; you get the feeling that each scruff and paint splatter was meticulously placed. Baby’s Breath and Succulents act as minimalist centre pieces, but this venue is more sophisticated than it is hipster. The outdoor patio area consistently bustled throughout the Summer months, though despite the number of occupied seats the ambience remained charmingly nonchalant; a far cry from Damson’s Soho location. On a warm day it is easy to imagine you’re sat in a quaint cobbled square far, far away from London. Perhaps the only grumble I would agree with Maschler on is the staff; whilst some are suitably charismatic, others are just a little too cool for school. Too much kale does that to a person. The overall ethos of Queenswood is very holistic; fresh flavours and wholesome food that not only tastes good, but feels good too. Don’t be put off by the number of little ‘v’ signs on the menu; they sit alongside steak and chips and cocktails a plenty. You don’t need to be Deliciously Ella to enjoy a meal here, a love of food and Mediterranean charm will more than suffice.